One of the more visible examples of the compact equipment industry’s momentum is the development of excavator and loader attachments. It wasn’t long ago that attachment catalogs typically started at the beginning of the alphabet with augers, ended with wheel saws and contained dozens of task-oriented hydraulic tools in between. 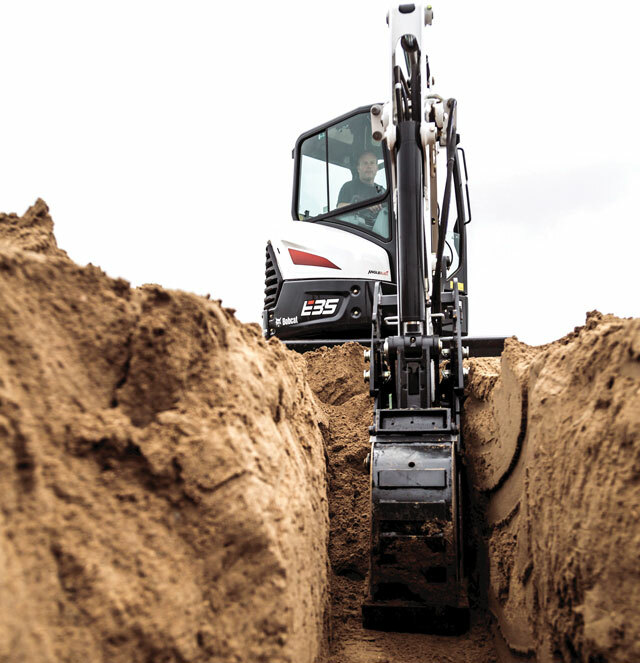 While versatile attachments have always been designed to enhance equipment fleets and assist operators with projects by reducing labor — and that won’t likely change — today’s compact machine operators now benefit from technologies aimed at increasing accuracy in grading and excavating applications and general attachment management. Tasks such as trenching for footings or utility lines or grading ditches call for a consistent grade or sustained slope. 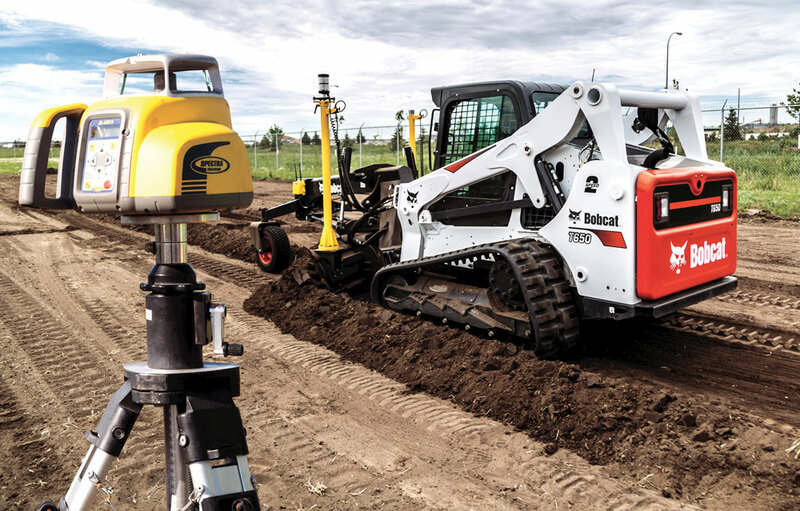 For excavators, grade control technologies are taking the legwork out of the project and helping operators dig faster and more accurately. The technology is designed to use a series of sensors that are connected to an instrument panel inside a compact excavator’s cab to track the precise location of the bucket teeth as the bucket, boom and arm moves. Laser-compatible systems can be calibrated to a specific machine as well. These types of systems can offer accuracy within a half inch, eliminating the need for excavator operators to stop the machine to enter and exit a trench for physical measurements. It also helps to minimize over-digging and under-digging and the costs and time associated with backfilling and compacting fill material to finalize depth or grade. Another offering in the excavation and grading category is a dual function clamp system for compact excavators. Excavators can benefit from one clamp attachment that offers both an adjustable standard tool and reversible grading tool. As a standard tool, the adjustable design allows it to be pinned in positions that provide either traditional grabbing performance or at a point that opens the jaw wider for handling bigger material such as larger-diameter utility pipe, boulders and logs. The dual functionality of this type of attachment occurs when the tool is pinned in the forward position where it can provide a smooth cutting edge on the bottom of a trench, eliminating the need for a second smooth lip bucket. In this reverse position, the grading tool provides a clamshell function against the bucket to aid in spoil cleanup, which can reduce manual shoveling requirements on a job. Sonic/slope and laser grading systems are grading attachments that are compatible with loader control technologies. When used properly, these automated grading solutions can deliver grade accuracy within one-quarter inch to provide precision in utility installations and paving projects. When mounted on compact track loaders or skid steer loaders, the housings of most laser receivers are designed with indicator lights to inform the operator if the blade is too high, too low or right on grade. In machines that offer instrumentation, the system significantly increases efficiency because the operator does not need to exit the machine’s cab to manually raise or lower either the laser receivers or the laser transmitter. Taking this technology one step further, the development of integrated sonic tracer and slope sensor systems provide an alternative method of automatic grade control on hilly jobsites not suited to lasers. When mounted on a grader blade, these systems provide many of the same capabilities as large road grading equipment for rough and finish grading. As an integrated system with an instrumentation program, the grade control system is designed to follow the contour of nearly any terrain and eliminates the need for a control panel on the grader attachment. To expand capabilities and increase efficiency even further, manufacturers also offer 3D grading systems. These systems use GPS or UTS to complete complex design projects like parking lots, sports fields and road work. A computer-generated model is uploaded to a loader’s control box, and the system automatically grades the ground with great accuracy. This allows operators to work at higher speeds without losing accuracy therefore increasing productivity. In addition to attachment developments, there has been innovation in attachment management with multiple functions and controls integrated into excavator and loader instrumentation systems. Attachment productivity can now be intelligently monitored and operators can see how they actually perform. For example, these systems allow operators to consult their display panels from the cab. Job clocks and cumulative hour meters compute usage on high-output attachments. Owners can also track parameters like bit life, maintenance and total life of an attachment to assist with future purchasing or rental decisions. Additionally, control panels afford the ability to calibrate auxiliary hydraulic flow rates to optimize attachment operation. Attachment technology continues to move toward greater sophistication and efficiency balanced with easy operation. The advancements made in new labor-saving attachment designs can translate into measurable efficiencies on the jobsite. With your busiest part of the year just around the corner, the time you take now to demo and understand these technologies could really pay off when your crews are pushing hard to meet customer expectations and deadlines in a few months. Jason Boerger is the marketing manager for Bobcat Co.
That was a really interesting article. I appreciate the technology that goes into making all the construction jobs easier and safer.